Anyway, after finally reaching the parking lot directly behind the Fairmont Hotel, I quickly grabbed my things and headed to the Regency Ballroom where the day’s activities would commence. And boy were we in for a treat! For starters, we were led in a time of praise and worship by the incomparable Gaye Arbuckle, who serves as the Minister of Music at the Concord Church of Dallas, TX. After that, my friend and brother in The Lord, Pastor Gaylon Clark (Lead Pastor of Greater Mt. 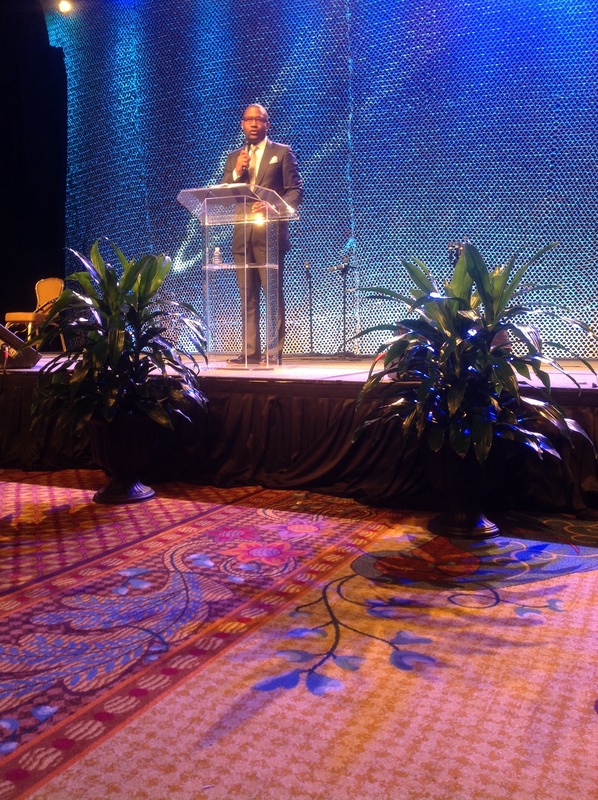 Zion Baptist Church – http://www.gmzaustin.org – in Austin, TX) took to the microphone as conference emcee to welcome us and open our morning session in prayer. By the way, if you don’t know, Gaylon is a great person, preacher, and pastor. It would be worth your time to get to know him, or at the very least become acquainted with his ministry work there in the Greater Austin area. Fuller began with defining the role of prophets. Prophets were not lone eccentrics. They were theologians. The prophets were preachers. Our task as preachers of the prophets is to re-preach the prophets’ sermons to a new audience. Integrative: You have to have a full, broad picture of the prophets. Ask: how do they fit into the grand narrative of Scripture? I. Who were the prophets? They took the covenant that God gave his people and applied it to current crises. II. What did the prophets do? Preached in the midst of cultural and religious diversity. Approached culture head on, demonstrating the weaknesses of competing world views (1 Kings 18). The prophets cut through cultural confusion, striking it with biblical truth. With clarity and stark contrast, the prophets ripped through cultural confusion to reveal ultimate truth. III. How do we do what they did? Homiletics means to “say the same.” Preaching is saying what the Scripture says. 1. Avoid inverting the hermeneutical process. Before jumping to grammatical interpretation, survey the historical situation. Exegesis is incomplete without context. When did this prophet speak? What was the issue or crisis at hand? What was the political, social, spiritual context? Who was in the prophet’s audience? Why did the audience need this message? Knowing why a prophet spoke is the key to understanding what he said. Reversal occurs when we begin with our current issues, press them into the text, and make the text support our agenda. 3. Return to the enduring theme of the prophets: repentance. Never think that the redemptive work of Jesus represses repentance; it fuels it. 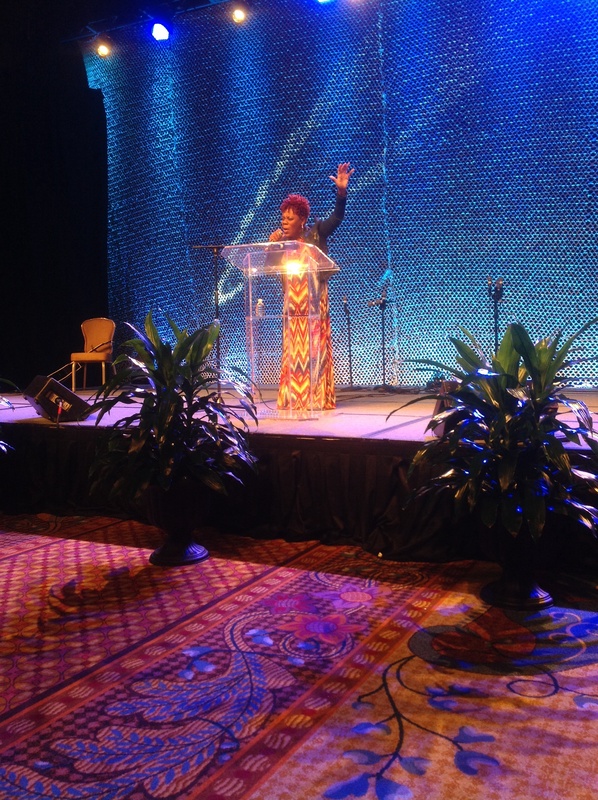 Gaye Arbuckle led us again in worship with a soul-stirring rendition of “Healer,” and then Pastor Bryan Carter, Senior Pastor of the Concord Church – http://www.concorddallas.org – in Dallas, TX, preached the conference opening message. There is no way I could give you all of it. You just had to have been there. But here is the gist of it. Speaking of Jeremiah, Pastor Carter pointed out two characteristics of Jeremiah and his ministry. He has character that won’t quit. Jeremiah didn’t abandon or withdraw from his God-given assignment. Jeremiah stood strong even in the face of opposition. Preaching is not just done in good times. Preaching is done in both good and bad times. True preaching is not dictated by people’s response. True preaching is dictated by a divine call. He has content that won’t fail. His message was not popular. Everybody may not be excited about what you are preaching. Don’t let society dictate what comes from your pulpit. Don’t be concerned with having a big church, but be concerned with big preaching. When we preach God’s word, there will always be people who will be offended with our message. Every preacher has to become familiar with pit ministry. If you want to be a true preacher of God, you are going to have to deal with some pit moments. A hard thing about pits is that you don’t always see them coming. Have you ever been stuck in the mud? Ministry stuck in the mud. Preaching stuck in the mud. Family life stuck in the mud. At this point, Pastor Carter did this run on being stuck in the mud. My recap won’t even do it justice. This just goes to show that preaching is an event. There is a unique dynamic in the preaching moment that the pen (or keyboard in this case) can in no way describe. At some point, there is going to be “but” in your story. God can use a complete stranger to get you out of your pit. God will pull you out of your pit. While Jeremiah was in the pit, God was in the palace working on his behalf. We broke for lunch and came back in the afternoon to attend two of the four-part workshop sessions on some aspect of preaching the Old Testament. The workshop offerings are comprehensive with subjects ranging from preaching law to preaching Christ in the Old Testament. I chose to take preaching historical narratives with a focus on the book of Nehemiah, led by none other than H.B. Charles, Jr., Pastor-Teacher of the Shiloh Metropolitan Baptist Church – http://www.smbcjax.com – in Jacksonville, Florida. If you are doing your job right, some weeks your members will leave celebrating, and some weeks they will leave convicted. If we handle the text right, every week can’t end with a shout. We ought not to offend people with our sermon presentation. But there is, as Paul says, an offense of the Gospel. Something is wrong with you if you preach about hell with a smile on your face. You should preach about heaven with a smile on your face and preach about hell with a tear in your eye. You need to do more than preach the facts about the cross at the end of your sermon. You need to preach the implications of the cross throughout. On writing and sermon planning – A bad page is better than a blank page. Have a sermon plan, but don’t be a slave to it. The key to exposition is authorial intent. In our study we are trying to build a bridge from the world of the text to the world we live in. And the bridge needs to land on both sides. If it doesn’t, it’s not a bridge. Exposition is not about style [of preaching], it is about how you handle the text. Bonus: Pastor Charles will also be hosting the inaugural “Cutting It Straight” Expository Preaching Conference in Jacksonville, Florida in September of this year – September 24-26 to be exact. H.B. is a prolific Bible expositor himself. That alone should encourage you to attend. But the lineup of men he has invited to teach and preach alongside of him is outstanding! For more information and to register, log on to http://www.cutstraight.org. As I said, there was way more that he downloaded on us in class; it was a mixture of informative content and pastoral/preaching/preacher exhortations. I pray you find these recaps helpful. Tomorrow, I attend another mini-conference; and if The Lord says the same, I hope to share with you a synopsis of what I learned. So, stay tuned. Posted on July 8, 2014, in Preaching, Teaching. Bookmark the permalink. 3 Comments. I have enjoyed your synopsis and your notes!!! Countdown to the Launch of our Church! My thoughts. My reflections. 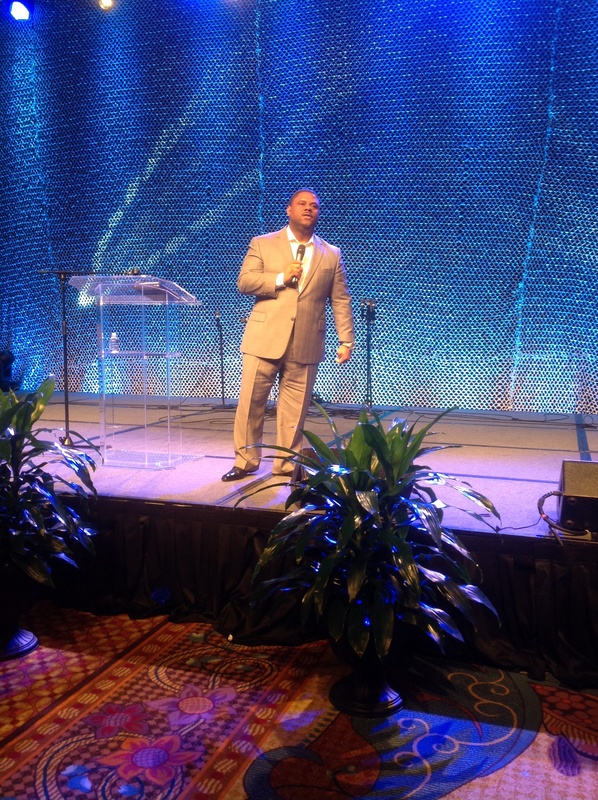 My journey.... On pastoring, preaching, leading & learning.